As organizations experience higher costs of energy, companies are looking into energy efficient solutions. Energy conservation has become not only part of global environmental conservation efforts, but also a social and economic issue. The recent initiatives of various levels of governments and public organizations related to green projects and green purchasing to help implement the objectives of environmental conservation has brought a heightened awareness of green computing issues to the general public. There is growing evidence that 40-60% of total energy consumption in large size organizations is coming from data centres and IT equipment. After lighting, computers and monitors have the highest energy consumption in office environments. Studies have shown that reducing energy requirements along with the power management of computers and monitors can significantly reduce their energy consumption, saving hundreds or thousands of dollars a year on electricity costs. The energy consumption of computers and monitors is determined by the amount of energy they require to operate and how they are used. While the energy requirements of a device make an important contribution to its overall energy consumption, the key to reducing energy consumption is changing how devices are used. Approximately half of all office computers are left on overnight and on weekends. Evenings and weekends account for 75% of the week, so ensuring computers are turned off at night dramatically reduces their energy consumption. Further savings are made by ensuring computers enter low power mode when they are idle during the day. Power management is a way of ensuring computers and monitors are turned off when not required and in low power mode during idle periods. Manual power management, which relies on educating users to turn off their computers, can achieve impressive results with ongoing education and reinforcement. Alternatively, automatic power management relies on software, or built in energy saving features. Theoretically, automatic power management can achieve 100% power management, with all computers turned off when not required and in low power mode when idle. 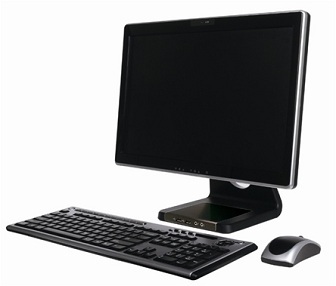 Eurocom (www.eurocom.com) has designed the All-in-One line of Flat Panel PCs to replace highly inefficient desktop systems. “Businesses today waste a huge amount of energy powering out dated inefficient electronics, especially desktop computers that are inherently inefficient, with much of the electricity being converted into heat” explains Eurocom president Mark Bialic. Utilizing high efficiency mobile components combined with an efficient power supply the Eurocom All-in-One solution saves energy and money. As companies experience higher costs of energy, it is becoming clear that an alternative to the traditional desktop is needed. A ‘green’ PC strategy is not only beneficial in terms of ethics and corporate responsibility but it can also significantly reduce energy costs. Eurocom Corporation, a leader in Desktop Replacement technology has taken the next logical step in the evolution of the computer system with their release of a 74 Watts ultimate desktop replacement, the fully upgradeable All-in-One PC EUROCOM Uno 2.0 . The new system is designed to accelerate transition from energy-wasteful desktop PCs to energy efficient and eco-friendly computers . The EUROCOM Uno 2.0 has a base price of $876 US dollars and can be upgraded with a multi-touch display, more powerful Intel Mobile Core i5, i7 and i7 extreme processors as well as an additional hard, solid state or hybrid drive and express card adapters. Major IT cost reductions over desktop PCs as a small footprint, All-in-One design allows for faster installation, relocation and operation at user's location - a traditional desktop PC requires installation and configuration of two pieces of equipment (PC Tower/Desktop and monitor). Companies can take its IT support to the next level, by supporting more users per each IT staff member. Extreme energy cost reductions due to low energy consumption 74W versus 200W-600W for a traditional desktop PC. (53W min mode, 74W max mode; 1.2W S3, 0.6W power off. The fully upgradeable EUROCOM Uno 2.0 features Intel's Mobile Processors i3, i5 and i7, 16GB of RAM, 1.24 TB Hard Drive, 1Gigabit Ethernet on-board, 2x Serial RS232; 1x External VGA; 1x HDMI-1.4 input; 1x USB 3.0; 4x USB 2.0; 1x eSATA; 1x RJ-45 LAN, and an active 19-inch Widescreen WXGA+ display, optional Multi-touch. The Uno 2.0 All-in-One PC offers low energy consumption, space savings, esthetics of design, and removes the limitation of wires through wireless connectivity, such as a wireless keyboard and mouse and WLAN. Eurocom is leading developer of desktop replacement and mobile workstation technology. Eurocom began with the goal of creating the most advanced computer systems and using advanced engineering techniques typically unseen in the computer industry. The company has produced many firsts and continues to engineer well-balanced machines and VGA solutions that inspire and enable individuals to reach great possibilities. For more information on Eurocom or to customize a machine, visit Eurocom.com.